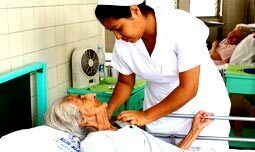 Our commitment to the Ecuadorian people goes as far as providing care for the elderly for about 500 senior citizens at our institutions. At our nursing homes, they are sheltered and cared for in a loving and peaceful environment. With experienced professionals and appropriate facilities, our nursing homes, Hospicio del Corazon de Jesus and Asilo del Bien Publico, we are able to care for the elderly with quality and warmth, giving them the chance to spend their golden years in a peaceful environment. Our nursing homes provide shelter for homeless and abandoned seniors, who are often neglected by their relatives. Here, we give them all the attention and love they deserve and need to live pleasantly through the final stages in their life. Our nursing homes offer many services to their residents. They are cared for and supported day by day, always receiving affection they cannot receive from their families. But besides food and shelter, we provide medical care, leisure activities and physical therapy, to improve their quality of life. Below you will find more detailed information on the social work we do for senior citizens, which shows that our services reach people in every stage of life. Over 500 abandoned or neglected senior citizens are given shelter and assistance at our two nursing homes: Hospicio del Corazon de Jesus and Asilo del Bien Publico. Doña Juanita found in our Hospicio del Corazon de Jesus a warm and attentive home where she could alleviate her loneliness. Here, there are many elders like her who are given all the devoted and heartfelt assistance they need, through whom, the extent of our social work is continuously reflected.